Made Ladybugs myself and the wings open and close. 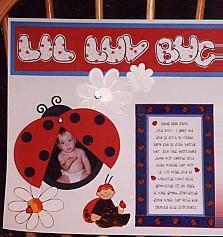 I used off-ray ladybug ribbon to frame photos. Stickerkin stickers. Daisy diecuts-o'scrap or frameups?